The latest available data from the federal courts show that during May 2012 there were 890 new consumer credit lawsuits filed in district court. According to the case-by-case information analyzed by the Transactional Records Access Clearinghouse (TRAC), this number is up 12.4% over the previous month when the number of civil filings of this type totaled 792. The comparisons of the number of civil filings for consumer credit-related suits are based on case-by-case court records which were compiled and analyzed by TRAC (see Table 1). 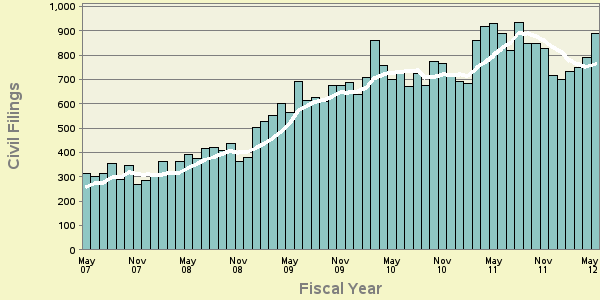 Monthly 2012 civil filings of this type are down 4.5% compared with those of the same period in the previous year. However, consumer credit civil filings are up 194% from what they were for the same period five years ago in May 2007, and have risen for four consecutive months. Most of these 890 filings were by individuals suing companies under 15 USC 1692, the Fair Debt Collection Act (635 filings), and 15 USC 1681, the Fair Credit Reporting Act (126 filings). The district with the largest number of lawsuits during May was the Central District of California (Los Angeles) where 100 suits were filed. The long term trend in consumer credit civil filings going back five years is shown more clearly in Figure 1. The vertical bars in Figure 1 represent the number of consumer credit civil filings of this type recorded each month. The superimposed line on the bars plots the six-month moving average so that natural fluctuations are smoothed out. One-year and five-year change comparisons are based upon the moving averages. During the first eight months of fiscal year 2012 a total of 6,256 federal consumer credit suits have been filed in federal district courts throughout the country. Relative to population, this total translates into an average of 20.4 suits per million individuals so far this year. Understandably, there is great variation in the number of these lawsuits in each of the nation's ninety federal judicial districts within the country's fifty states. Table 2 shows the 10 districts with the most lawsuits and the 10 districts with the fewest lawsuits so far this fiscal year relative to each district's population size. The count of 450 actual filings in the District of Colorado (Denver) means that in relation to population this district was the busiest in the nation, with over four times the national average of such lawsuits per person. Second was the District of Minnesota (Minneapolis) which recorded a total of 338 consumer credit lawsuits during the same period, or over three times the national rate. The Western District of New York (Buffalo) came in third, also having over three times the national rate of consumer credit suits filed relative to its population. At the other extreme were the District of Alaska (Anchorage), the Western District of Louisiana (Shreveport), South Dakota (Sioux Falls), the Western District of Virginia (Roanoke) and Idaho (Boise), which all had fewer than two consumer credit suits per million in population so far in fiscal year 2012. If the number of suits filed were considered — without adjusting for population size — it is not surprising that the three federal judicial districts that ranked highest are all centered in large cities. Topping the list was the Central District of California (Los Angeles) with 600 suits, followed by the District of Colorado (Denver) with 450 suits. New Jersey (Newark) was third with 417 consumer credit suits so far this year.